Nearly half of all Case IH models sold globally, including the Axial-Flow 8010 combine, are now approved for 100% biodiesel (B100) use. Case IH has also announced that when approved supplies become available, every engine that powers Case IH equipment globally will leave the factory with a biodiesel blend in the fuel tank. “At present, every engine in every piece of Case IH equipment is approved for the use of five per cent biodiesel blends and the majority or our models are also approved for blends up to 20 per cent,” says Kevin Pritchard, Brand Manager – Tractors. Our ability to now offer farmers the choice of using B100 blends in selected machinery marks an exciting time in machinery evolution,” says Kevin Pritchard. “It’s our policy that the only time a piece of our equipment leaves a factory without biodiesel in the tank is because the fuel is unavailable seasonally, as happens in the United States’ winter months, or we don’t have a source that meets established quality standards,” Kevin Pritchard says. “It’s good environmental stewardship,” he points out. The decision to implement B100 blends came after extensive field testing to determine performance levels in equipment. In addition the new ultra low sulphur diesel fuel characteristics were evaluated as part of a programme to ensure maximum productivity as use of that fuel becomes mandatory. However it is important for farmers to remember that fuel quality has an impact on the engine warranty. B5 blends must meet the requirements of U.S. standard ASTM6751 on the base biodiesel stock. 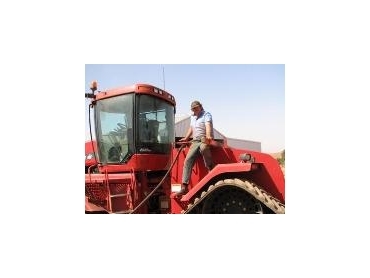 Farmers looking to use B100 blends need to follow proper protocols, including having dealers install special parts and approve warranty extensions to help the vehicle perform as they would expect with this higher level of biodiesel. General practice for all blends of biofuels include sourcing approved biodiesel from reliable suppliers, ensuring filters and oil are changed at regular intervals. Customers are advised to speak with their dealer on specific issues before moving to a higher biodiesel blend. Case IH’s move to embrace B100 is being commended by farmers, as a growing number of producers begin to grow their own crops specifically for biofuel production. Western Australian farmer, Phil Logue, who runs an 8,200-hectare mixed cropping operation at Ajana, north of Geraldton, has spent the past three years moving towards 100% fuel self-sufficiency. “About three years ago we started dabbling in biofuels and today we run all of our Case IH gear including a 2005 model 2388 harvester and a 2006 model 2388 harvester on 100 per cent biodiesel processed from crops we’ve grown ourselves,” Phil Logue said. The 2006 model 2388 is equipped with the new 8.3 litre CDC engine with High Pressure Common Rail fuel system. Phil Logue also runs his Case IH STX375 and STX325 tractors on 100% biodiesel and says the performance on biodiesel is ‘no different’ from that of ordinary fuel. “In fact, I think the engines actually run quieter,” he said. The decision to move into biofuels came about after a substantial proportion of his canola crop was not up to scratch following the ongoing drought. At optimum oil content, the same amount of crop would produce 35,000 litres, so the decision was a financial investment in the future. “We all pool our crushed oil, resulting in about 200,000 litres a year. The majority of these farmers run Case IH gear on a 50 per cent blend including an STX450 and another 2388 harvester. Generally, filters and oil is changed at 250 hours,” Phil Logue added. This year, Phil Logue will dedicate 250 tonnes of canola to biofuels, which will lead to 100% self-sustainability in terms of fuel usage. He also hopes to work with other local farmers to open a press and blending facility in Geraldton. “Around 90 farmers have indicated an interest, so if it gets off the ground, we’ll have more control over costs, which will lead to even greater long term sustainability,” says Phil Logue.